Home BUSINESS Thika-Based company plunges into energy drinks production. Thika-Based company plunges into energy drinks production. The MD Kevian Limited Kimani Rugendo (centre) takes the German Minister for Economic Cooperation and Development, Dr. Gerd Muller through the stages of fruit juice production during a tour of the German delegation to the company in 2017. Thika-based Kevian Kenya Limited has now ventured into the production of energy drinks. The producer of Afia and Pick N’ Peel juice brands will now be producing three variants of its new ‘Afia Energy Drink’; apple, classic and strawberry flavours to compete with RedBull from Australia and America’s Monster Energy. The company’s Managing Director Kimani Rugendo says that a can will retail at Sh120. “The market response has been very inspiring for the few weeks the new product has been in the market. Our end-game has been on quality, accessibility and affordability,” said Rugendo. 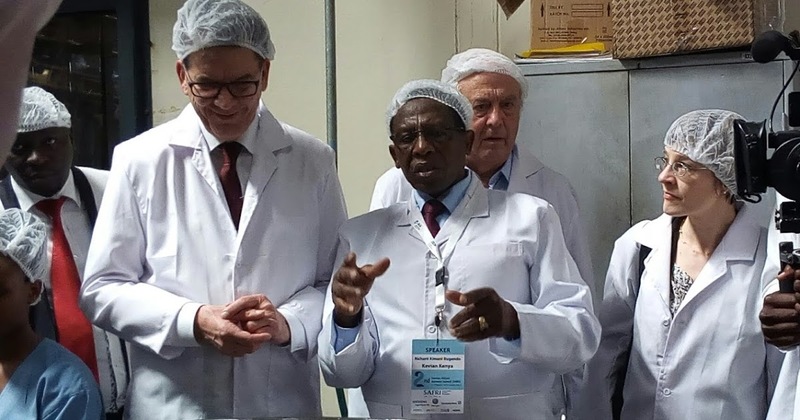 Following support of the German Investment Corporation, Kevian, which also has a plant in Nairobi, has ventured into production of non-alcoholic malt drinks, tomato sauce and ready-to-drink coffee. The new production line is expected to create about two hundred new jobs both directly and indirectly.